The book examines whether the jurisdiction of coastal States under international law can be extended to include powers of intervention towards vessels posing a significant risk to their coastal and marine environment, but which have not yet been involved in any incident or accident. The books sets out how it is that coastal State jurisdiction can indeed be seen as including powers of intervention towards High Risks Vessels before an incident or accident happens, on the basis of the precautionary principle. 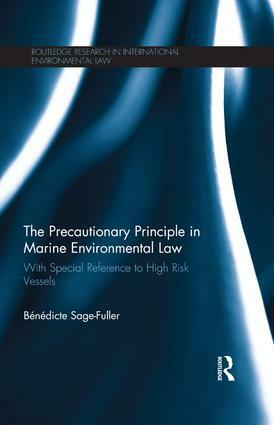 The precautionary principle requires taking action when a risk of damage to the environment is suspected, but cannot be confirmed scientifically.The book thus considers the potential opportunities for the coastal state under international law to regulate international shipping where they consider vessels to an unacceptable risk to the environment, in order to prevent or minimise the risk of occurrence of the accident or incident leading to damage. The book acknowledges that this puts into question some very old and established principles of the law of the sea, most importantly the principle of freedom of navigation. But Bénédicte Sage-Fuller contends that this change would itself be a consequence of the evolution, since the end of WWII, of on the one hand international law of the sea itself, and of international environmental law on the other hand.